From Thanksgiving until New Year's, New York City is a holiday lover's destination. Check out the holiday shows and events that can add some Christmas zest to your Big Apple vacation. Whether you like dancing, singing, plays, or dazzling lights, from Brooklyn's Dyker Heights to a train show in the Bronx and Carnegie Hall to Lincoln Center, New York City brings holiday joy to visitors and residents alike with events all over town. The Radio City Christmas Spectacular is sure to amaze and entertain the whole family with a flying Santa, a nativity scene, and 3-D glasses. And, don’t forget about the Rockettes in wooden soldier costumes wowing the crowds with their kick lines. Get tickets to one of the most festive shows of the entire holiday season. The New York City Ballet continues its annual tradition of performing George Balanchine's "The Nutcracker" at Lincoln Center. Matinees are extremely popular and tickets go quickly. About 90 dancers, 60 musicians, 30 stagehands and two casts of 50 young students make each performance as magical as possible. The Holiday Train Show at the New York Botanical Garden is an annual holiday tradition. Featuring model trains and over 150 replicas of New York City landmarks, like the Statue of Liberty, Brooklyn Bridge, and Rockefeller Center, the Holiday Train Show is a wonderful experience for children and adults. The show is held indoors, making it a wonderful experience no matter what the weather is like outside. Head to Brooklyn's Dyker Heights neighborhood (either on your own or with a tour) to see these unbelievable holiday light displays. 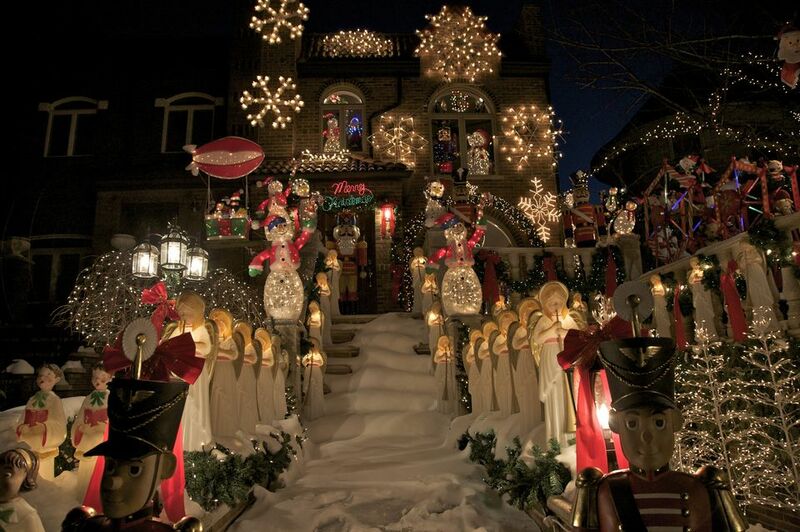 Each year, over 100,000 people flock to the Brooklyn neighborhood to witness some of the most over-the-top Christmas lights, huge inflatable Santas and snowmen, and houses that blast Christmas carols from loudspeakers. Enjoy the New York Pops annual holiday celebration at Carnegie Hall for an interdenominational holiday concert featuring traditional favorites. This one-man production of Charles Dicken's iconic Christmas tale is a moving, intimate experience. An audience of just 40 people sits in the parlor of the historic ​Merchant's House while the talented Kevin John Jones plays 20 different characters over the course of the one-hour production. An annual tradition since 1874, the Oratorio Society performs Handel's Messiah at Carnegie Hall. The 200-voice chorus, soloists, and orchestra deliver a performance that will send your holiday spirit soaring. Enjoy this annual musical adaptation of this Dickens classic at The Players Village theater in the West Village. Charles Dickens’ classic holiday tale about the joy of community triumphing over selfishness is presented in this fresh musical adaptation by Sgouros and Bell. Follow Ebenezer Scrooge on his emotional journey, as he is visited by four forewarning ghosts. This production features updated, British pantomime-inspired scenic design. The Cathedral of St. John the Divine hosts a variety of musical and religious events throughout the month, including Advent services, the Cathedral Christmas Concert, children's workshops, and their Peace Tree. The Candlelight Carol Festival and production of Handel's Messiah are among the performances scheduled for December at the Riverside Church in the City of New York. The Candlelight Carol holiday service combines carillon, organ, harp, and all of the church choirs in a rousing musical celebration. The church is located at 490 Riverside Drive. The West Village Chorale hosts its annual Handel's Messiah Sing, Village Noel, and Caroling Walk in mid-December. The walk begins and ends at Judson Memorial Church, 55 Washington Square South (at Thompson Street). It may be crowded but seeing this iconic New York City event can kick off your holiday season. The free tree lighting ceremony is open to the public and includes live performances. After the November lighting, the tree remains on display until early January. No need to take your family out in the cold to view the holiday displays in New York. You can view New York City’s holiday festivities and decor through floor-to-ceiling windows from the comfort of a multi-million dollar motor coach, the largest tour bus allowed on the streets of New York City. The tour is hosted by two on-board New York City experts and features live street performers. Rides run from late November through early January. Visiting the Origami Holiday Tree at the American Museum of Natural History has become a holiday tradition. The tree has an annual theme and is decorated with hundreds of hand-folded paper ornaments. You can get in the act too. Volunteers will be on hand to teach Origami paper folding. The event takes place late November through early January. Christmas in this historic Staten Island community of Richmond Town transports you back to the days of horse and carriage. In New York City's most complete historic village, you can take a carriage ride, enjoy the lights and old-fashioned decorations, and listen to a choir sing Christmas carols. Have a visit with Santa and shop the gift fair. Reservations are required. The Queens County Farm Museum hosts a free holiday open house annually in December. The farm dates back to 1697 and is New York City's largest remaining tract of undisturbed farmland. Tour the decorated Adriance farmhouse, sip mulled cider and let the kids enjoy the crafting workshop. The gingerbread event at the New York Hall of Science has made the Guinness Book of World Records for quite a few years for having the largest gingerbread village—all edible. The houses are baked, planned, built, and decorated over the course of an entire year. You can visit the village and sign up for a gingerbread house workshop to make your own. Yes, the iconic toy store has returned. The new F.A.O. Schwartz opened in November 2018 in Rockefeller Center. The giant piano is there and so are classic, over-the-top toys. The 20,000-square-foot store will be worth a visit even just for the Christmas memories.